How long is the coastline of Australia? It is a simple question, but the answer can be quite controversial. Do you simply measure directly from headland to headland, and add all those distances? Perhaps you could try to measure the smooth sweep of the bays and beaches as well. Let’s not worry about the influence of the tides. Then again, as you measure around a headland, should you measure in and out of each crack and inlet into the rocks? What about the mouths of rivers and streams? Do you simply measure across them or do you go upstream a little? How far? On a smaller scale, you would discover undulations in the sand that would create a wavy line where it met the ocean. I hope you can see that, as the scale is shrunk down, you will see more and more detail that needs to be accounted for. Perhaps you may have heard of the Koch snowflake, named after the Swedish mathematician Helge von Koch (1870-1924). Helge von Koch was fascinated by recursion and, among other things, experimented with distorting a straight line to form a Koch curve (three of his lines create the triangle named after him). He simply replaced the middle third of every line segment with a pair of line segments that form an equilateral ‘bump’ as you can see in the animation above. Step-by-step, more bumps are added for ever. The Koch snowflake has a finite area (you could hold this one in your hand), but its perimeter is infinitely long! Not only that, but because it has infinitely complex detail, you cannot place a tangent to the curve anywhere, so it is nowhere differentiable. Enquiries into such recursive things appear to have begun with that great German polymath and philosopher, Gottfried Wilhelm Leibniz (1646-1716). The development of this field of mathematics (fractals) is dotted with objects like the Sierpinski triangle (1915) and the Sierpinski carpet (1916) at right, both named after the Polish mathematician, Wacław Sierpiński (1882-1969), and the Menger Sponge (1926), named after the Austrian-American Karl Menger (1902-1985). These, of course, were only representative of the real developments taking place in the mathematics and concepts behind these ideas. Mathematicians were interested in these structures/patterns that had self-similarity (so their detail seemed the same at any magnification or level of inspection), were nowhere differentiable, had fine or detailed structure at arbitrarily small scales, yet having simple recursive definitions. The term fractal was first used by mathematician Benoît Mandelbrot (1924-2010), a Polish-born French-American mathematician, in 1975. I remember the excitement about Julia Sets and Mandelbrot Sets during those days while I was in university. Mandelbrot based the term fractal on the Latin fractus (meaning broken or fractured), and used it to extend the concept from theoretical fractional dimensions to geometric patterns in nature. 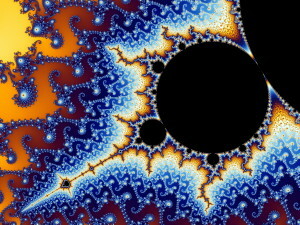 The general population could not understand the mathematics, but were captivated by the images that were produced (see top left for a Mandelbrot Set as an example of fractal art). When microcomputers were first appearing with coloured screens (EGA) during the 1980s, it was common for writers of freeware and shareware to produce programs that produced Julia and Mandelbrot sets! I remember that some of them took minutes to calculate one image. I wish to thank Dr Wolfgang Beyer, an astronomer and physicist from Munich, who kindly posted the Mandelbrot Set that I featured here (as well as other wonderful images) to Wikimedia Commons.